In frigid winter, Vermont's snapping turtles stay burrowed in mud beneath the ice. For some five or six months, they're in a state of torpor, and we don't give them any thought. Then, inevitably, as the sap runs and the sun heads north, the reptiles begin to stir. With this winter's generally milder weather, some animals have already been on the move. That's evident particularly on the roads: a skunk yesterday, an opossum the day before that. These road fatalities remind me of the snapping turtle I found run over last June, just beyond my driveway. The body was at the edge of the road, straddling the pavement and the shoulder. The sight of the crushed turtle made me uncommonly sad — and angry, because the death seemed avoidable. The driver surely didn't have to hit the animal. Shortly before the drive-by killing, my wife had mentioned that she'd seen a snapping turtle climbing the outer bank of our pond, heading toward the water. "It's not our pond anymore, is it?" I commented. "It's the snapping turtle's." I laughed. There was a time when I'd considered this place mine. Some years ago, I herded a snapping turtle with a shell the size of a hearty dinner plate into an empty five-gallon Spackle bucket. I wasn't sure where the turtle had come from, but I didn't want it in our pond. So I carried the prehistoric beast the half mile across our meadow and the neighbor's hayfield to deposit it in Lewis Creek. In those days, I still imagined that we might have some control over such matters. I live in a ruralish place by choice. It's not as out of the way as it was when my wife and I first arrived here 30 years ago, but it's not a city, and it's not a suburb. Not yet. A fox, or several, turned up last year. We watched one toying with a small rabbit, much as a cat toys with a doomed mouse before finally dispatching it. At night, the yips and singing of coyotes are common. No music is more moving. Our older dog used to howl with the wild canids. He has gone hoarse, however, and the younger dog simply barks protectively when the coyotes are within range. I preferred it when the older dog harmonized. There is plenty of room here for us and our regular wild companions — and occasional visitors, including a bear at the bird feeder. We now take the feeders down in the spring, but not before the snow disappears. My wife is responsible for creating two dozen of the fattest squirrels in Vermont. Every year we argue about whether the time has come to end the winter's feeding. I am right in these disputes, but she prevails. About 25 years ago, we dug the large pond that sits at the edge of a field, at the foot of a wooded hill that rises to the west. It is a "sky pond," as our neighbor described it. There is no year-round running water to fill the pond and maintain its level. Rain, some in the form of runoff from the hillside, fills the large hole. The water level has receded a little during summers, but the pond has never come close to going dry. Over the years, the pond became inhabited by frogs, which were always present in the damp places nearby, and fish. Three species of fish simply showed up. Not all on the same day, of course. They didn't swim into the pond, because no fish can swim up a gravel driveway and across a meadow. According to wildlife experts with whom I have spoken, the fish probably hitched a ride as eggs on ducks' or herons' feet. The arrival of the fish alone should have told me that we don't run things around here — certainly not at the pond. The return of a snapping turtle ended any illusions that I might have weakly maintained. Don't misunderstand me. I have always admired snapping turtles. They possess enduring toughness, coupled with an unnerving quickness when striking that is paradoxical in a lumbering beast. Yet, however much they impress me — and even though snapping turtles have been described as "shy" when in the water — I didn't want one to bite my wife, son, visitors or the dogs. Most of all, I didn't want one to bite me. I also didn't want a car to run over "our" turtle. 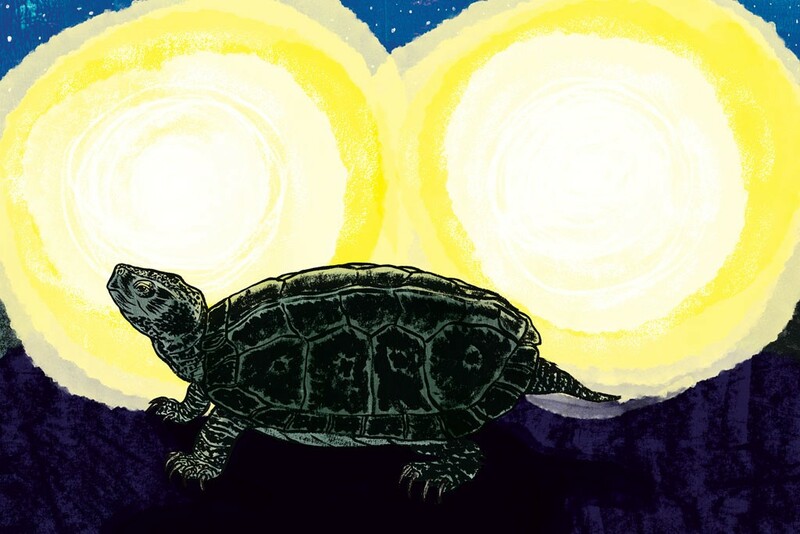 Snapping turtles, hard-shelled and fearless, walked the earth with the dinosaurs. They have somehow survived into a time of unfathomable speed. Today's pace — our ubiquitous sense of urgency — is too much for them. When crossing a road, slow-moving turtles are at their most vulnerable. Proper human etiquette is to slow down and drive around them. I have run over a skunk. He didn't have a chance, and neither did I. A couple of small birds have bounced — dead — off the windshield or grill of a vehicle I was driving. I don't think I was speeding, but even the speed limit is sometimes too fast. When I've lamented these deaths, some have suggested I should direct my concern to battered women, abused children, the greedy overclass, governmental lies, real issues. I get their point of view. I say, though, that we are blessed with capacious minds. I can be pained by the wanton crushing of a snapping turtle and still have ample capacity to concern myself with other matters of importance. That turtle was crossing the road abutting a wetland and was only a hop-skip from Lewis Creek. She (he?) was just a turtle being a turtle. Our job is to allow that. To think otherwise is to be arrogant, to feel entitled to a superiority on this planet that we humans do not deserve. Make room for the turtle. The original print version of this article was headlined "Turtle in the Fast Lane"
WTF: Should Vermonters Try to Deal With Rabid Wildlife Themselves? Why Are There Suddenly So Many Rabbits?